a different story, I think. 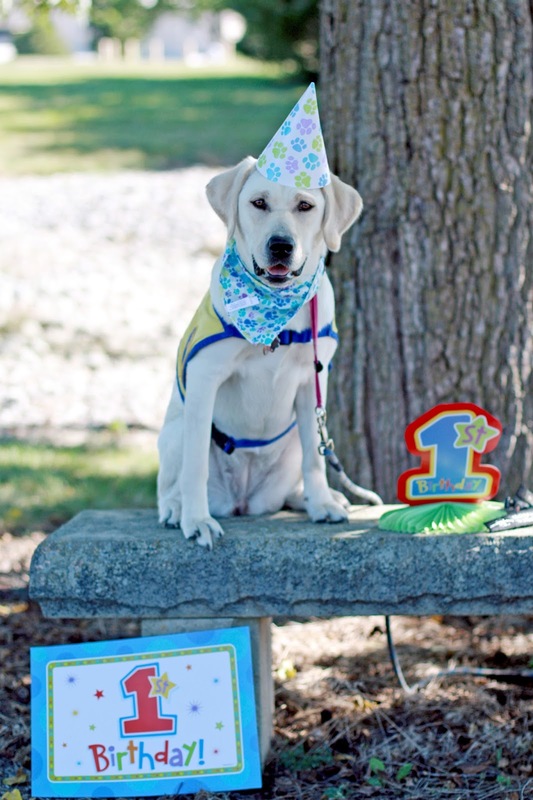 When you pick up Skyler* today, you'll want to bring a change of clothes with you, I told Skyler's mom on the phone. It seemed like a good idea, this impromptu pizza party for my little kid and his new friends. What better bonding experience is there than breaking bread together anyway? I think none. Or I thought none. Now I know better. You see, we had just moved into town, separating my kid from his life long friends, and then plopped him into a new school to start kindergarten. So on an otherwise bleary fall day, I came up with the inspired idea to invite over a few of his elementary school pals for a pizza and playtime. Sounds good, right? What a good mom, so thoughtful I was. Sure, we all know the truth on this don't we?Allow me to break down how things went deeply and terribly awry. We can start off with my lack of knowledge about the energy level of young boys. The activities of an only child can be readily tracked. One usually knew, at least generally, where in the house he was most times. Add a six-year-old friend and it was necessary to merely bump your vigilance up to Code Yellow to make sure nothing gets set on fire or something. But three or more kindergarten age boys in the house? It's pure pack mentality, y'all. They share one brain and move together in a swirling mass sucking in random items and depositing debri at whim. Now put a pizza and Kool-Aid lunch into the equation and we've added biological functionality to the fray, alimentary track-wise. That is, what goes in must come out. Over excited boys plus lots o'pizza equals the Skyler Incident. In my six short years of raising a child, I had never (never!) seen anything like this. The big D it was. Spread about my water closet-sized half bathroom. The sink, the floor, the walls (!) and of course, the porcelain throne itself. I actually swooned, the room went gray and fuzzy for a second, when I opened the bathroom door to Skyler's call for assistance. Like a crime scene with the whole splatter thing going on, only this was, well . . . you know. It's like the kid used a paint roller or something. Boys! I called loud enough to make them jump. Outside! Let's play Capture the Flag! Skyler, honey, you just sit here in the grass until your mom gets here, ok? To my defense, I did not get the garden hose out. It was just too cold for that. But that I did actually consider it for a second probably negates my defense plea. Twenty years after this emotional trauma upon my delicate psyche, I'd like to think my party planning skills have improved. Lessons learned and all that. But that would just be silly talk. 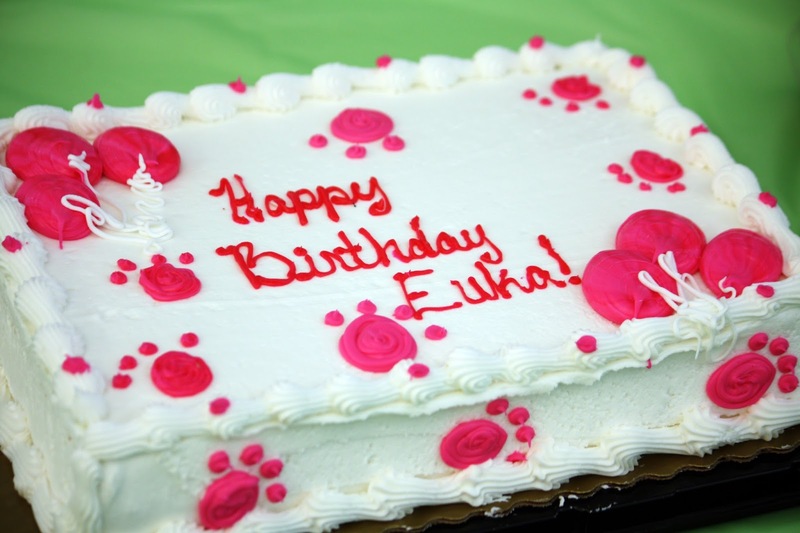 To celebrate Euka's first birthday we held a party in her honor at the office this week. A combo affair, this. 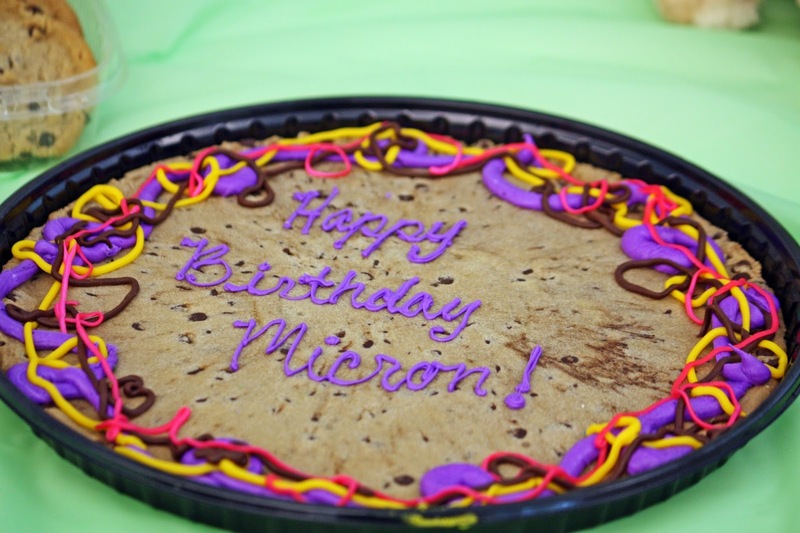 Micron's fourth birthday is later this month. 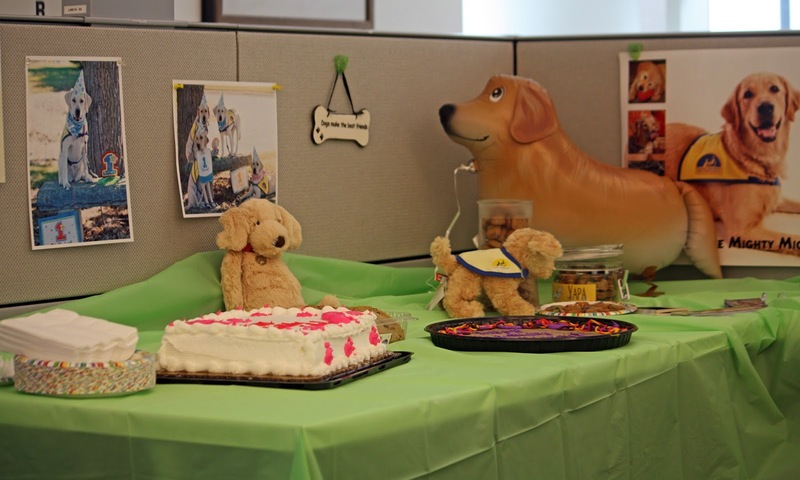 Sure 'nuff, we're pet passionate folk here in the office and a dog's birthday party is totally a socially acceptable kinda event. 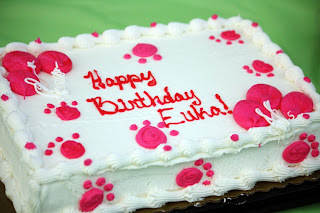 And yes, people asked if this was a dog cake or people cake. Hint: It's a people cake. Really, you can trust me. However, two dog parties in the same month teeters on that fine balance of Socially Acceptable and Crazy Dog Lady. So only one party, but we'll invite all co-workers and canine friends and make a big hairy deal out of it with cake and cookies and balloons and such. 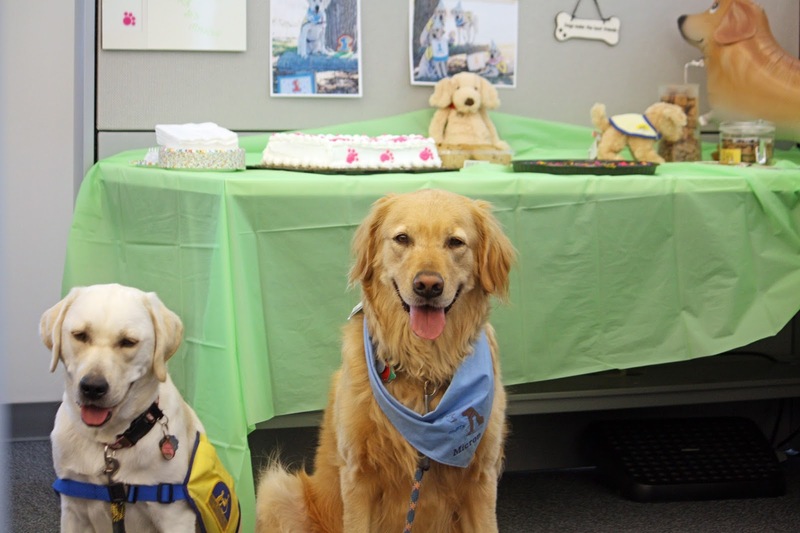 Then as per invited, the dogs started showing up and it was kinda like six-year-olds at a pizza party. 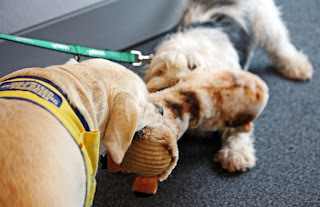 We human beans all took a step back as new stuffed toys were inspected for weaknesses then efficiently disemboweled. Squeakers nestled gently inside the polyester stuffing were pulled out and displayed proudly like the still beating hearts of their prey. 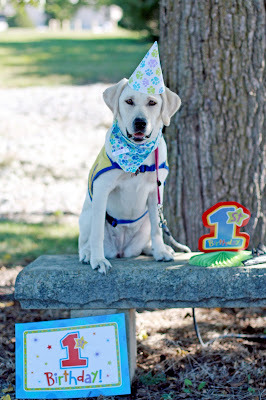 As I waded through the white fiberfill stuffing to rescue canine digestive tracks from processing afore mentioned squeakers (he makes a funny sound when he farts, Doc), the various dog leashes became tangled about dog legs until Micron eventually became the official birthday piñata all prepped to hang by his ankles. Communications, the esteemed Pawl Griffin. I gotcha, Mike, I say. 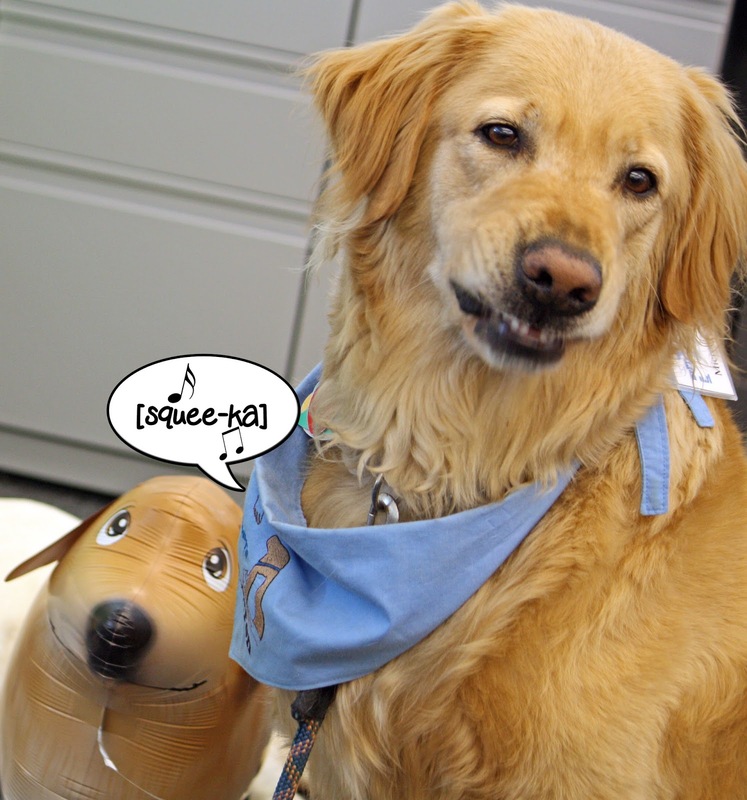 There, now go sit over here for a minute so I can pull Euka off of the company mascot. But, the squeaky! cries Micron. It's still in one of the toys! I have to get it out . . .
At this point, I'll go ahead and admit it was my full intention to take lots of photos of the birthday action, including a group photo of Euka and Micron with their friends. Didn't happen. Actually, never even came close to achieving this lofty goal. Instead I have a full set of, wait just a sec and I'll count . . . yeah, I got eighteen shots of Euka and Pawl Griffin that look more or less like a two player game of Twister (See photo above right.) Well, I suppose three players if you count the half stuffed hedgehog toy tossed about in the melee. But you know what? It was an awesome time, really. A nice break in the office that enhanced our company culture in P&G Pet Care and we enjoyed watching the dogs as they wore themselves out in mindless play. And having cake and cookies was icing on the . . . wait, I need another metaphor. Well, anyway it was another bonus for us humans to enjoy. 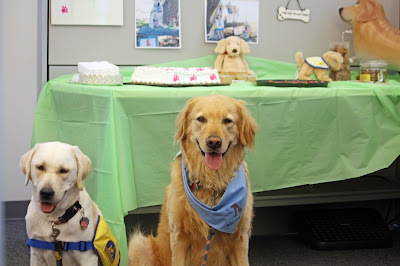 Oh and Reason #148 of why dog parties are better than kid parties. No Skyler incident, thank dog. No need for a bucket brigade to recover from this party. I can pick up stuffing innards all day long, y'all. Par-TEE ... Par-TEE ... Hey Food Lady, is it 2:00 yet? Naw, I didn't swallow a squeaker. Why? * Name changed, not necessarily to protect the kid's identity, but mostly because I don't remember his name. This was nearly twenty years ago, people. Ok, I'm just messing with you. I do remember his name and it wasn't Skyler. But it does rhyme with it. Yeah, and I realize I really I need to get over this and move on, thank you.